The excavations in the region began in 1990. The most impressive piece that was brought to light is the wall, at the top of the hill that was built in the classic years. The different ways of construction can be distinguished. The wall determines the western limits of the ancient city, surrounded by the sea. The powerful fortification supplemented round and square towers and ramparts that connected with heavy scales. At the top of the hill also appears the relic of the citadel. At the part behind, between the hills, is the well-maintained remainder from some beautiful, spacious public building, with a gallery and a monumental facade with pillars. 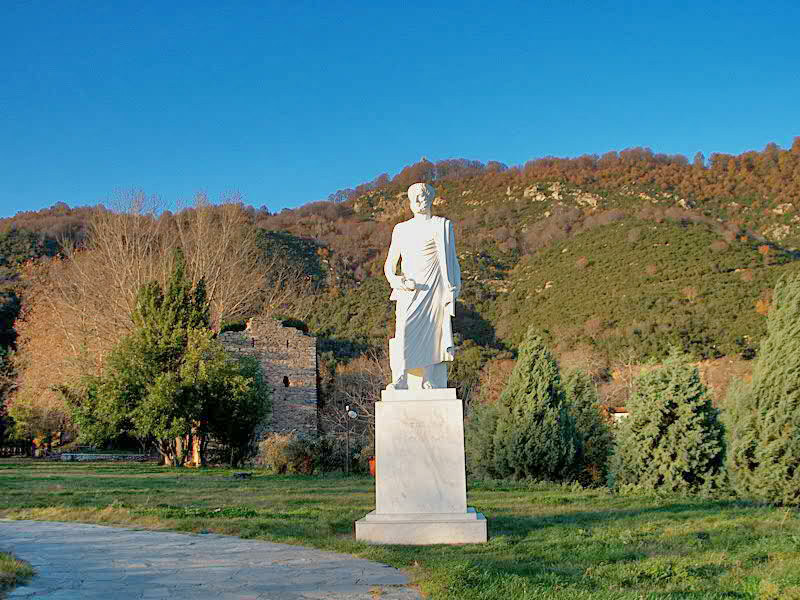 Aristotle’s park. The Theme park is located in a most outstanding area with a marvellous view towards the gulf of Ierissos and the whole peninsula of Athos. When the weather is good you can see some of the monasteries on Mount Athos using a telescope. It also includes a series of other instruments which when used properly will show the phenomena of nature. All of this is dedicated to the famous philosopher and his work called “the Natural”. The instruments include a prism, optical discs, sounding bars, a compass, sundial and pendulum – all illustrating important phenomena studied by the great philosopher. The fortress complex, of which only three partly ruined towers exist today as well as the ruins of the public bath that Ishak Pasha constructed in the 15th century. The central temple dedicated to the “Birthday of the Virgin Mary”, built in 1814. Also interesting is the small chapel dedicated to the “Virgin Mary the Spilotissa” built in rock. The ruins of Sidirocaussia. Many ruins exist around the hill of St. Demetrios (the site of the bath). Make you you have walked in the evergreen paths and admire a panoramic view.